Split plane plastic rings are made of UV stable PVC (DARVIC). They are produced in following colours: red, yellow, orange, black, white, medium green, dark blue, violet. Different sizes are available: from 2,2 to 11.3 mm of internal diameter. Rings of larger sizes (up to 25.0 mm) and violet colour are made of celluloid. Applicator is enclosed free of charge with the rings of sizes up to 4.5 mm of internal diameter. 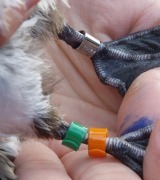 For larger rings no applicator is required. 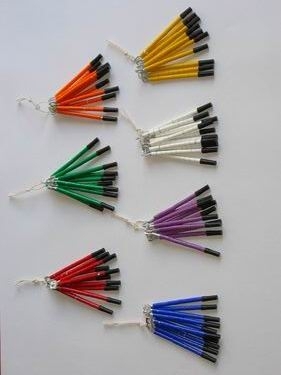 A minimum order is ten rings of one colour (set)! 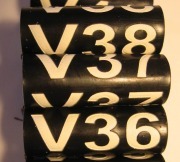 Numbered rings and collars are made of two-ply UV stable plastic (GRAVOPLY). They are available for medium-size and large birds in various colours: (e.g.) * white letters against a red, a dark blue, a dark or a green background, * black letters against a yellow (a white) background. Please note: numbered rings are made for individual orders only. The price depends from size, number of digits/letters to be engraved and total quantity of ordered rings. Alumimum rings - made in long series. Numbered according to request with additional ringing center decription(s). Full range of sizes available!